Friedrichshafen - "In no other invention is utility so inherently combined with a pleasurable experience as on a bicycle,” German Chancellor Angela Merkel said, quoting Opel founder Adam Opel when she opened Eurobike on Wednesday, 28 September 2013. While she has had less opportunity to adhere to this principle since being invested with Germany’s highest political office, she has ridden a bicycle since she was a little girl. 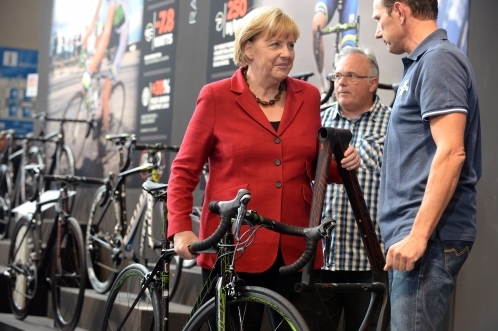 "Eurobike is equally as important as Cebit and the International Motor Show. A comprehensive appraisal of transport in our times necessarily includes the bicycle. 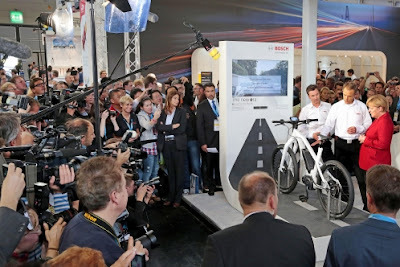 Germany is not just a car nation, it is also a bike nation,” the premier stressed. On the opening day of Eurobike - the leading international trade fair for bicycles and cycling - the key players in the bike industry presented the trends and new products for next season and the German Chancellor revealed that the cycling trend had made its mark on public policy: "With the cycle traffic plan 2020, we are committing the German Government to promoting cycling. We aim to create the conditions that will encourage those who have perhaps thought about cycling to take it up.” The Chancellor particularly thought that the boom in e-bikes could be an attractive prospect for older generations, enabling them to enjoy cycling on any terrain. A combination of different modes of transport was an important approach to persuading as many people as possible to take up cycling, Angela Merkel said. At the opening ceremony, Bernhard Lange, President of the German Bicycle Industry Association, said: "Cycling has become a megatrend, with everyone meeting in Friedrichshafen at the leading cycle trade fair, Eurobike - the global showcase of the cycle industry and mobility worldwide.” He noted that cycling had arrived in the political world and had become a securely anchored part of mobility, and added: "While the use of the bicycle for leisure and sport purposes achieves general health benefits, the bike is of huge importance as an environmentally friendly means of transport in a future-capable, sustainable mobility concept." Eurobike is open daily from 8.30 a.m. to 6.30 p.m. on the trade-visitor days - Wednesday, 28 August to Friday, 30 August - and is open to the public from 9.00 a.m. to 6.00 p.m. on Saturday, 31 August. Further information is available online at: www.eurobike-show.com. 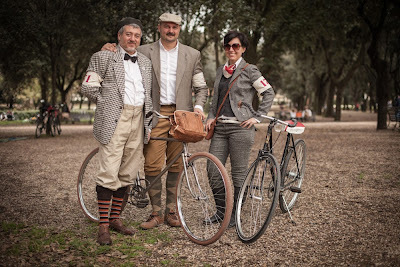 The next Tweed Ride event will be held in Milano on September 8th at the Avirex Showroom, Via Comelico, 24 - Milano; from 09:30 to 17:00.A fashion capital, Milano should produce a great event. Tweed Ride event information for Italy can be found at www.tweedride.it. Pinarello extends Team Sky partnership with a new three-year deal signed for 2014, 2015 and 2016. 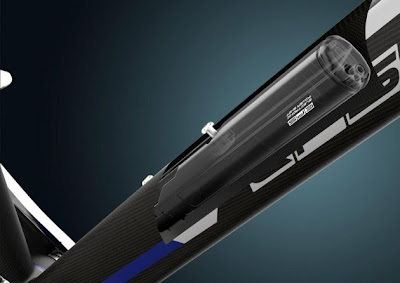 Pinarello was a founding partner of Team Sky in 2010 and has worked closely with riders, mechanics and performance staff to help develop the road and time-trial bikes that have played a key role in the success of the team. Team Sky riders have taken 136 wins on Pinarello bikes – including 27 Time Trials and 12 National Championships – worn leader’s jerseys at each of the Grand Tours and won successive victories at the Tour de France. The team first used Pinarello’s Dogma 60.1 before Sir Bradley Wiggins won the Tour de France on the Dogma 2 and Chris Froome repeated the feat on this year’s Dogma 65.1. Time Trial success first came on the Graal with the all-new Bolide introduced at this year’s Giro d’Italia. Team Sky’s Head of Operations, Carsten Jeppesen, said: "This has been a great partnership and it’s natural to extend our relationship with Pinarello. Fausto is a real gentleman, his team understand us, are excellent to work with and we’ve really enjoyed developing bikes with them over the last four seasons. The Dogma and Bolide have certainly worked for us; over 130 race wins, twelve riders earning national champions colours and, of course, those two successive victories at the Tour de France." Fausto Pinarello said: "I want to thank everyone on the team – from the riders to mechanics and all the staff – for the great support that they have given us during the last four years. And a special thanks to Sir Dave Brailsford, the strongest leader in the peloton. It’s my honor to be a Team Sky partner and I am sure that together we’ll make the best bikes in the world." Sir Dave Brailsford, Team Principal of Team Sky said: "Over the last four years our relationship with Pinarello has been a true partnership, one which we are delighted to be extending. Not only do they share the same desire for excellence, but from Fausto right through the company they are an absolute joy to work with. There is a lot more we want to achieve as a team and we go forward knowing we have the best partner to do that in Pinarello." 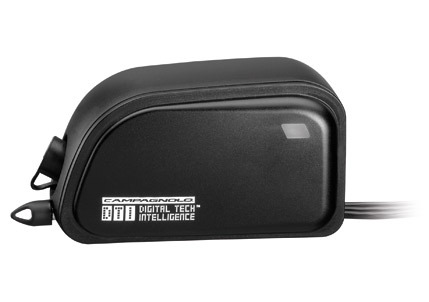 For the 2014 product line Campagnolo will have a new, streamlined, cyclinder shaped, battery that can be externally or internally mounted. 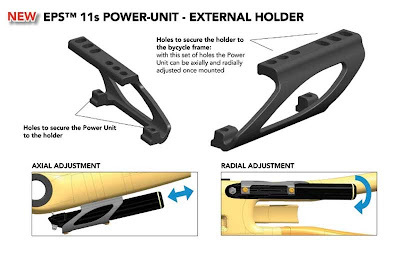 If mounted internally a 7.2mm hole in the frame will be required to accomodate a charging port if the battery is not be be removed for charging. The drawings courtesy of Fair Wheel Bikes, here, which also has additional details on other 2014 Campagnolo products. "The revered Italian high-end frame manufacturer De Rosa is the Official Bike of the 2014 Campagnolo Gran Fondo New York, held on May 18. 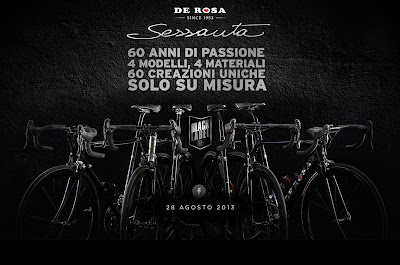 De Rosa, founded by Ugo De Rosa and headquartered in Cusano Milanino, Italy, celebrates its 60th anniversary this year. Campagnolo Gran Fondo New York 2014 consists of a 100-mile route with over 8000ft of climbing and a 50-mile non-competitive GFNY BEAR. Both distances provide formidable challenges truly worthy of their New York venue as part of the most international cycling event in the world. "I've been a fan of De Rosa frames from the day I got into cycling as a kid", says Gran Fondo New York CEO Uli Fluhme. "We're honored to have De Rosa on board as a partner. The Gran Fondo New York philosophy is to partner with companies and people who stand for the same values as we do: passion for the sport of cycling, authenticity and quality. 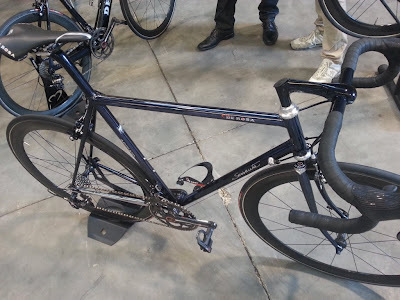 De Rosa is also a natural addition given that Ugo De Rosa and Tullio Campagnolo worked together closely for decades, with Valentino Campagnolo and Cristiano De Rosa continuing the close working relationship, and Campagnolo being the Title Sponsor of the event." De Rosa has been a builder for many champions such as Rik Van Looy, Eddy Merckx and Francesco Moser. While De Rosa today focuses on carbon, they continue to work with steel, titanium and aluminum, always staying true to their tradition. "De Rosa is very glad to partner with a great project like Campagnolo Gran Fondo New York. The Gran Fondo market is very important for us. In Italy, De Rosa is the Title Sponsor of Gran Fondo Florence and now adding Campagnolo Gran Fondo New York gives us a prominent presence in the capital of the world" said Cristiano De Rosa. As part of the partnership agreement, De Rosa will produce a Campagnolo Gran Fondo New York Protos by De Rosa frame. The Protos is the top frame produced by De Rosa and will be awarded to the overall man and woman winners of Campagnolo Gran Fondo New York and will also be available for sale. The official Campagnolo Gran Fondo New York bike will be equipped with Campagnolo Record components. The frame will have the CGFNY colors: NYC style matte black with neon green accents. Besides the winners of GFNY 2014, the eight members of CGFNY's Gruppo Sportivo ambassador team, who lead the free weekly group rides for registered participants of CGFNY14, will each ride a CGFNY Protos by De Rosa. 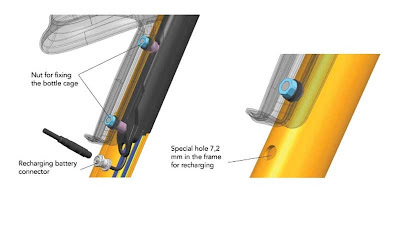 A select number of CGFNY Protos by De Rosa frames will be available for purchase. Avid Campagnolo Gran Fondo New York fans have long requested to buy a bike frame of the event. With De Rosa's timeless classic design combined with modern technology and understated Italian style, the CGFNY Protos will have global appeal." The Belkin Pro Cycling Team riders will race on Bianchi bikes next season. The Dutch WorldTour team attracted the Italian cycling brand as its new technical sponsor and official partner for the 2014 and 2015 seasons, with an option to extend. "Bianchi is one of the best known bike brands in the world and part of the legacy of cycling, building its future on the knowledge of its incredible history," Belkin Pro Cycling Team general manager, Richard Plugge said. "The match with Belkin is perfect; technical innovation is important for both Belkin and Bianchi. We are very happy to further build our team together with these two great partners." Bianchi will supply the team starting from 2014 with its race proven Oltre XR.2 and the new exclusive Infinito CV with patented Countervail Vibration Cancelling technology. For races against the clock, Bianchi will provide the team with a new super aerodynamic time trial carbon frame that will be unveiled at the start of the season. By partnering with the Belkin Pro Cycling Team, Bianchi maintains its place at the highest level of cycling. "We are excited to partner with the Belkin Pro Cycling Team and to work closely with its successful world-class riders to improve our product technology," Bianchi CEO Bob Ippolito explained. Bianchi's dedicated product development in all disciplines will complement Belkin's well-balanced roster. "GC contenders, sprinters, time trialists and classics riders will all profit from our special types of bikes. For example, Bianchi will supply the classics team with our new Infinito CV endurance bicycle, the ideal machine to conquer cobbles and long distances thanks to our innovative Countervail technology,” Ippolito continued. "The team's project, led by Richard Plugge, brings to cycling a new and global brand but at the same time, calls on experience and heritage. We are confident that the association between the Bianchi and Belkin brands will lead to a successful global partnership." The first edition of the "Granfondo COLNAGO, Desenzano del Garda" will take place on Sunday, September 22nd, expo and other events on the 21st. Desenzano del Garda, on the southern shore of Lake Garda, is a beautiful location for racing and a visit. Now establishing a closer link with Colnago, plans are already proceeding for moving the granfondo to Spring of 2014 (Sunday, May 4th) in order to be able to further lengthen the long and medium courses and add more climbing. 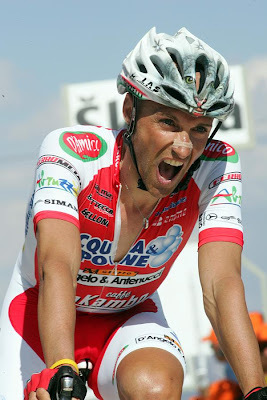 Stefano Garzelli is officially retiring on August 23rd at the Tre Valli Varesine race, on his home soil of Varese. His career began began in 1997 with the jersey of Mercatone Uno in which he won the 2000 edition of the Giro d'Italia, his best success. "In the end I think I'm the only rider who has won a jersey in every special edition of the Giro d'Italia", noted Garzelli in the past. "Pink jersey in the Giro del Giubileo (Jubilee Giro, 2000), green jersey in the Giro del Centenario (100th Giro Anniversary, 2009) and another green jersey in the Giro dell'Unità d'Italia (150th anniversary of Italian Unification, 2011)." The first Tre Valli Varesine was held in 1919. Past winners include Bartali, Coppi, Magni, Motta, Moser, Saronni and Bugno; Garzelli won he race in 2005 and 2006. 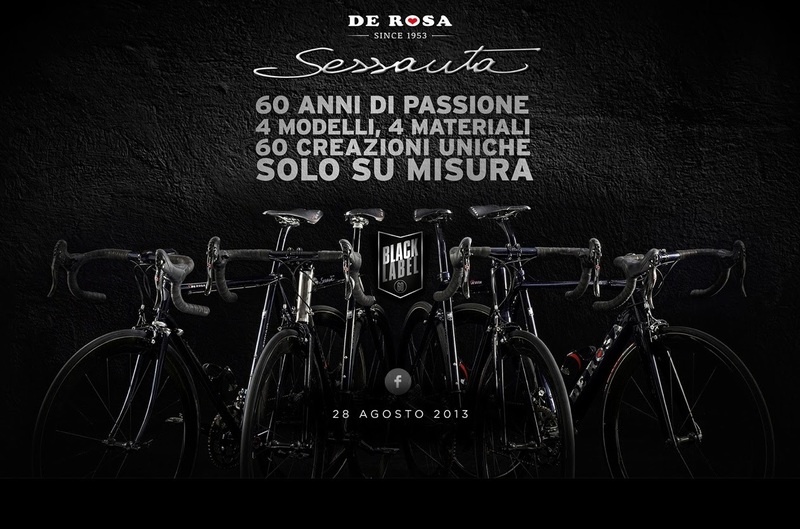 As we explained earlier, to celebrate its 60th anniversary, De Rosa will introduce the Sessanta Black Label (sessanta = sixty) series of bikes begining at Eurobike which starts on August 28th. There will be four models in four materials: aluminun, steel, carbon and titanium in limited editions. For the additional photos visit www.italiaanseracefietsen.com. When you do note: the top photo is of the aluminum version, then in the series of photos underneath,left to right, are the aluminum (again), carbon, and steel bikes with the titanium in the next row. UCI Travel is offering cycling fans the chance to win a VIP package to watch the final three days of the UCI Road World Championships in Florence, Italy. The 2013 World Championships in the heart of Tuscany run from September 22nd to 29th. The winner of the UCI Travel competition will be able to watch first-hand the Men’s Junior, Under-23 and Elite road races and the Women’s Elite road race. The package, for two people, also includes accommodation, access to the exclusive UCI VIP area and a behind-the-scenes tour. To be in with a chance to win, participants in the competition must state their favourite cycling event and why, then describe in 50 words or less their ultimate cycling experience. Second prize is a UCI Road World Championships rainbow jersey signed by 2012 Time Trial World Champion Tony Martin. The author of the third best entry will win a €100 UCI Travel voucher. Entries close on August 26th at 11.55pm and the winners will be notified on September 2nd. UCI Travel is cycling’s premier travel operator and was born from a partnership between the UCI and Mummu Media, online specialists in sports, media and entertainment travel. You can find all the latest World Championships news and information at www.toscana2013.it. There will be four models in four different materials, 60 creations and only made to measure. Stay tuned! For those that have inquired: there will be a gran fondo event held as part of the World Championships in Florence in September. The Gran Fondo Mondiale Franco Ballerini will start and finish in Lucca on September 21, passing through some of the same towns of the road world championship courses. There will be three routes: a lungo that will be challenging from an elevation gain and technical perspective, the medio that will use parts of the lungo course, and the “cicloturistica” which will take riders through the hills of Lucca. The week of World Championships is from September 22nd to 29th. For this all the information can be found at You can find all the latest news and information at www.toscana2013.it. RCS Sport has announced that the 2013 Gran Piemonte edition, scheduled for Friday, October 4, has sadly been cancelled. RCS gives the reason as, "The international economic situation and, in particular the Italian one, has put many sporting events, including the Gran Piemonte, in serious difficulty. Added in the UCI Europe Tour calendar, the Gran Piemonte, which in 2012 saw the victory of the Colombian Rigoberto Uran, suffered economic hardship that has led the organisers to the decision to cancel the event." RCS Sport owns the Giro d'Italia, Milan-Sanremo, Il Lombardia, Tirreno-Adriatico, Strade Bianche, and Gran Piemonte races. In-store Campy CODE customers will be able to find highly skilled and up to date mechanics on the world of Campagnolo thanks to specific technical training across the product range, and in particular on Campagnolo EPS electronic groups. The CODE will also be the reference point for the brand in the area for all local activities such as product test sessions devoted to new Campagnolo products. The stores will also have the earliest product news. 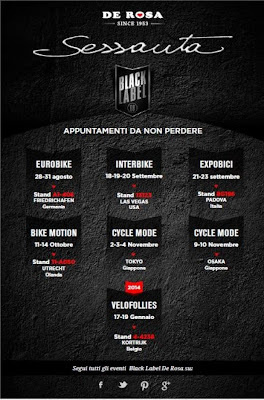 There may be an announcement at Eurobike, at the end of the month, about extending the program outside of Italy. In any case, if you find yourself needing Campagnolo service or information the above list should be useful. Do you have five friends that want to try a team time trial challenge with you near Venice? On Sunday, September 22nd, in Jesolo, Pinarello Travel in association with city of Jesolo, the Veneto Region, and the tourism consortium of Jesolo are organizing the 2nd edition sieperandrea/6xAndrea (6 for Andrea). 6xAndrea is a team time trial of 6 members, 24 km in length, held along the amazing Jesolo seaside. Only 120 team can be registered so reserve a spot for your team now, it wil be an unforgettable day! And, if you arrive on Friday, things will get started there will be a party in the evening with music and a cabaret show in Piazza Aurora. The event is named after Andrea Pinarello, son of Giovanni Pinarello, who passed away of a heart attack after completing the first stage of the Giro del Friuli in 2011. A hundred cyclists rode along the historic roads of Montelparo, in the Marche region, as part of the “I Forzati della strada” ("The Convicts of the Road") vintage cycling event on July 28th. Riding in the event were Giorgio Furlan (winner of Milan-Sanremo) and Pietro Guerra (teammate of Felice Gimondi), and Dutch, British, U.S., and Italian riders. The cyclists gathered within the among the ancient walls of the village of Montelparo for the start, on the hottst day of the year, before heading out to ride on the many white roads that wind through the hills of Fermo. All the participants enjoyed the five rest stops plus a lunch of of traditional country dish specilialties from Fermo. During lunch some 40 random draw prizes were drawn, one prize being a pair of custom made leather cycling shoes by Carlo Corvaro. In addition to the world class riding available in the Fermo area don't forget to consider the Marche region, in general,for cycling.